My son has really enjoyed my food blogging. He loves to create and take pictures so he likes watching me pull things together in our kitchen, document the methods and ingredients, and carefully take photos of the steps I take along the way. It has become such a part of our lives that he vies for the plate which contains the carefully arranged finished product for a recipe that I’ve just finished for the blog or I’ll ask who wants the “blog plate” or I’ll announce that one of them gets the “blog one” tonight. I’ve also had everyone ask on several occasions if I had taken a picture yet, before we all started eating. I am very grateful for my family’s support. Sometimes dinner takes much longer than it should with my obsessing over flavor adjustments and especially when I’m struggling to get just the right photos. I’m still a novice at picture taking so it’s been a learning experience. Every once in a while I say, “I’m cooking without my camera tonight!” and it’s a signal to myself and to them that anything goes. It’s liberating, but I still have to stop myself from grabbing the camera which lives in the kitchen now. When my boys want to cook something I ask if they want to blog it or just make it, and when I’m blogging a recipe sometimes they ask if they can help. Most of the time I let them, especially when I need an extra hand because one of mine is taking a picture at a critical moment when something could scorch. My youngest son is so excited about the whole thing that he sat brainstorming with me one afternoon this summer on recipe ideas. 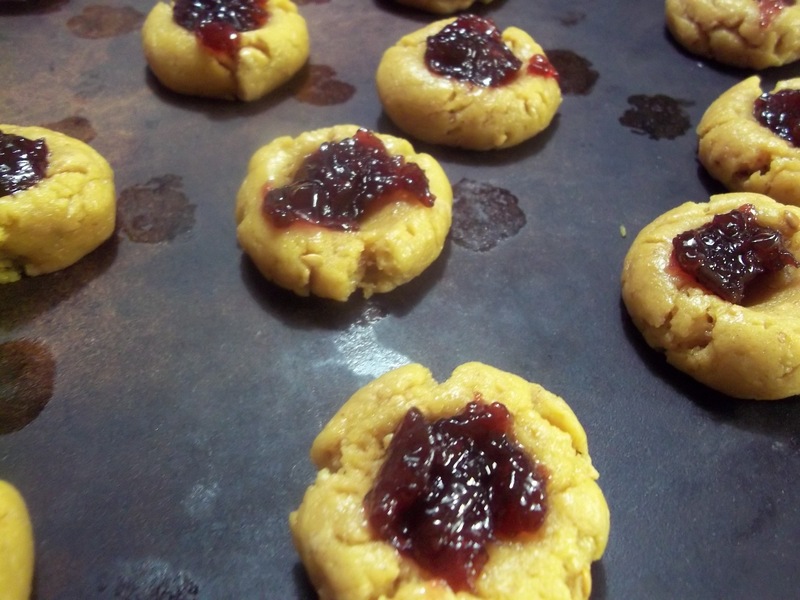 His face lit up, and barely able to get the words out, in an excited voice he suggested that we take my peanut butter cookie recipe and make them like jam thumbprint cookies, which I taught him to make this past Christmas, and put grape jelly in the centers to make…P-nut Butter and Jelly Cookies. I love light bulb moments. I was so proud. What a GREAT idea!! On a day that his friends were coming over, he asked if he could make them, so while the others played we did. The finished cookies literally disappeared so quickly off the tray he had placed in the center of the table after lunch that he only ended up snatching a couple for himself. He was pleased, however, that everyone liked them. When we were cleaning up later, he wanted to look on the internet to see if anyone else had been clever enough to think up the idea. The poor little guy!! 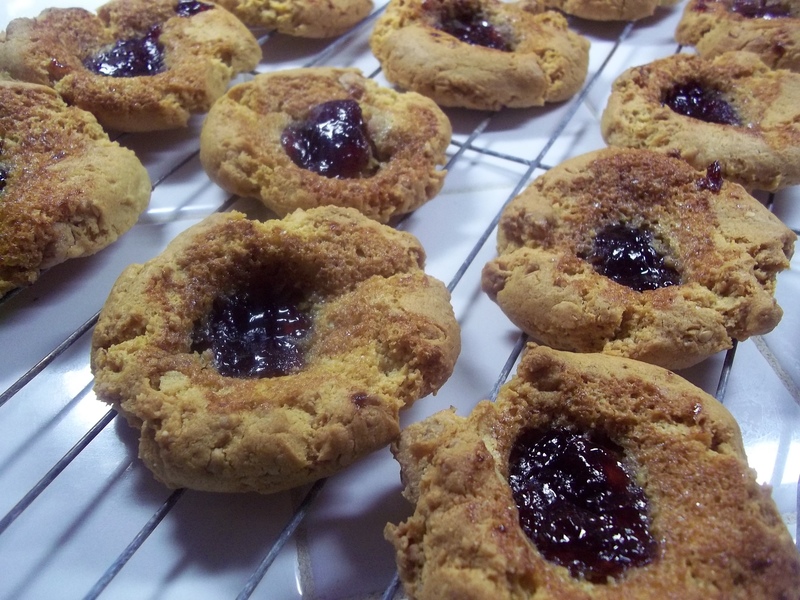 There are peanut butter & grape jelly recipes ALL OVER the web. I felt so bad for him but let him know that it showed what a very good idea it had been and told him he was a natural little cook. If anyone tries the recipe and likes them, please let me know in the comment section so I can tell my son. Thanks! 1 c. of creamy peanut butter. Heat the oven the 350 degrees. Mix together all of the ingredients but the jelly. 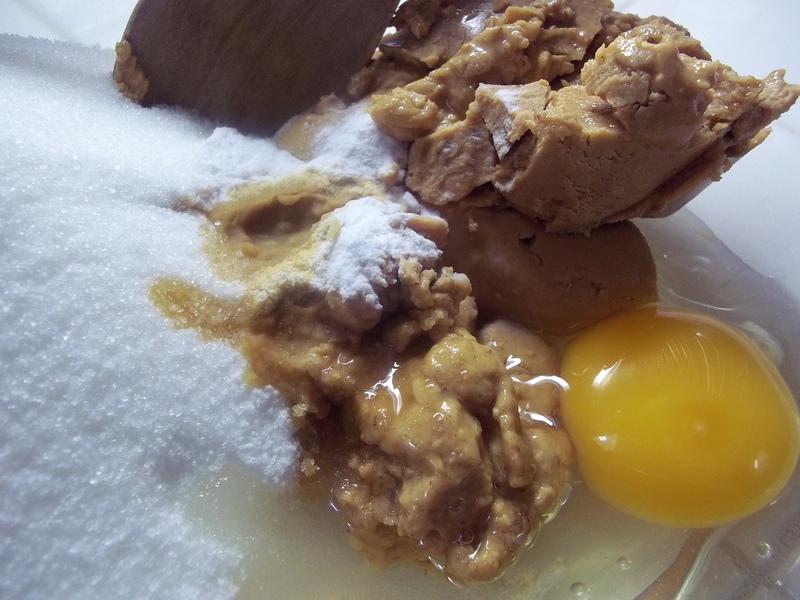 Scoop the dough by rounded teaspoons and shape into balls. 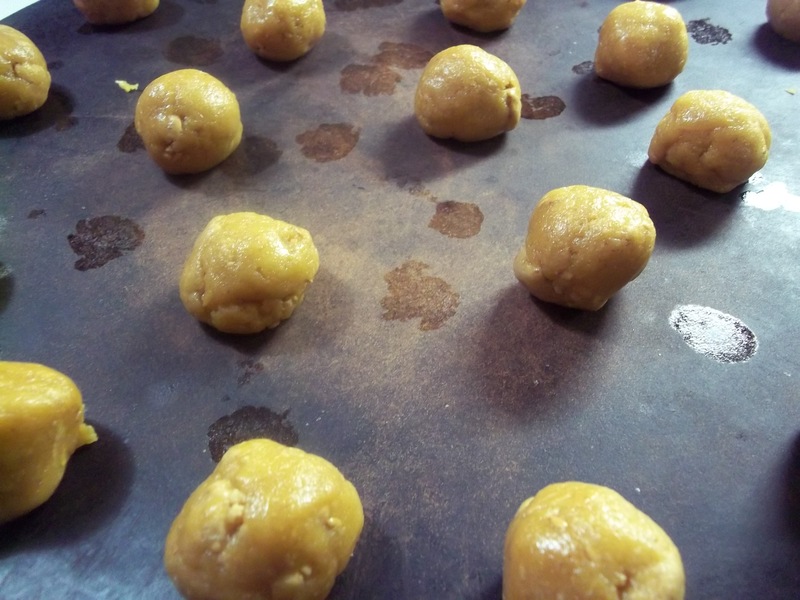 Place the balls onto a cookie sheet or baking stone, 2″ apart. 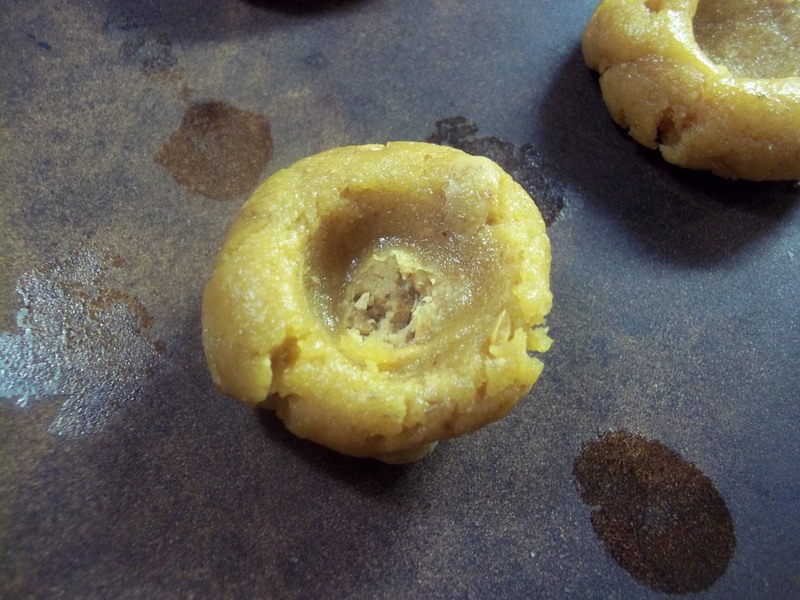 With your thumb, press an indentation into the dough. Immediately remove and cool on baking racks. The biscuits look excellent, by the way.